Your Scuba Buoyancy Compensating Device (BCD) or Buoyancy Compensator (BC) is one of the most expensive pieces of dive gear you will buy. That being said, with proper care, your BCD will provide many years of reliable service. The following preventative maintenance must be performed to extend the life of your BC. Avoid prolonged exposure to direct sunlight and extreme heat. Nylon fabric can quickly fade when exposed to the sun's ultraviolet rays, and extreme heat may damage the welded seams of the BC's air cell. Avoid repeated or prolonged use in heavily chlorinated water, which can cause the BC fabric to discolour and decay prematurely. Do not allow the BC to chafe against any sharp objects or rough surfaces that could abrade or puncture the air cell. Do not set or drop heavy objects such as block weights on the BC. Fresh, clean water is all that is normally needed to clean your BCD, though you may use a mild liquid detergent diluted in fresh water, or a commercial BCD conditioner like McNett BC Life Cleaner and Conditioner for BCDs, in the final rinse to inhibit the growth of mold or mildew and to keep the BCD fresh and odour-free. Complete cleaning and maintenance system for all types of BCDs. Leaves BCD shell, interior lining, hoses and valves conditioned and free of damaging salt crystals, chlorine and organic residue. The best way to prevent the growth of harmful moulds and bacteria is to use the BCD frequently in salt water. Salt water effectively inhibits the growth of fungus and molds, and most materials used in the BCD are impervious to salt water. Never use solvents (such as alcohol or paint thinner) since they may attack the fabrics, bladders, glues or fasteners. Cleaning is especially recommended immediately after use in a chlorinated pool, as chlorinated water will quickly break down rubbers and plastics. Soak — If you can, soak your BCD in fresh clean water as soon as you take it off. A lot of times this may not be possible, so rinse it if you can and/or pack it away carefully to soak as soon as you are able. Check for Leaks — Partially inflate your BCD and put it in the rinse tank. Move the BCD around and put a little pressure on it. See if you can see any bubbles escaping. Mark the location of any leak, allow the BCD to dry, then repair with McNett Aquaseal or by O2ToGo Dive Centre. The industry standard for maximum strength repairs to wet suits, dry suits and all water sports products. Work Moving Parts — Work any and all moving parts while submerged to get all gritty particles out. Depress the oral inflation buttons and power inflation buttons to make sure they move freely. You should do this both in the soak/rinse tub and outside the tub. If they seem sticky, there may be sand or corrosion hindering the movement. If you rinse the BCD and they still seem sticky, you should have them checked out by O2ToGo Dive Centre. The last thing you want is to have the power inflation button stick and rocket you to the surface. Rinse Outside — After you have let the BCD soak for a while, i.e. 30 minutes or longer, thoroughly rinse it off with a hose or shower head. Zippers — Work the zippers to ensure they are free of any gritty particles. Rub zipper wax, paraffin wax, plumbers candle, beeswax or whatever other non-petroleum based wax you may hear about on scuba forums or from other divers, on the outside edges of the zipper. You don't need a lot, just a light coat. Then work the zipper back and forth. Clean Velcro — Use a toothbrush to remove sand from Velcro and other nooks and crannies. When it comes to washing your BCD, it's hugely important to not only rinse the exterior with fresh clean water, but also the interior of the air cell or bladder. During a dive, salt water leaks into the BCD bladder through the dump valves and the low-pressure inflator, and must be drained out during your post-dive maintenance routine. If you fail to do this, the salt water in your BCD bladder once evaporated, will leave salt crystals — some large enough to act like pieces of glass and tear or rupture the bladder bag. A good internal rinse will eliminate this. To do this, use a garden hose to flush fresh water into the BCD's bladder via the low-pressure oral inflator, making sure to hold down the deflate button as you do so. The Trident BCD Washout Hose makes this easy and stops you from getting wet. Lets you easily hook up your garden hose to your standard BCD inflator for easy BC bladder cleaning. Allow the water to flow into the BCD bladder until it is approximately one quarter full, and then orally inflate it. This will allow the water to easily circulate around the inside of the BCD. Then, shake it vigorously to make sure that the water reaches every part of the BCD bladder before pulling the ball/cord assembly and allowing the water to drain through the OPV/dump valves, simultaneously rinsing them too. Repeat this until the water that drains out doesn't have a salty taste. Fill with air and deflate with force to push as much "wet air" out as possible. Repeat as many time as necessary until the air being expelled is as dry as possible. Once this has been done, fully inflate the BC, and allow it to dry inside and out. Caution: We've seen people use all sort of stuff to 'clean' or 'sanitise' the inside of BCD bladders, but we think it's a poor practice unless you use the proper commercial products intended for this purpose like McNett BC Life Cleaner and Conditioner for BCDs. Just say NO to cleaning your BCD with stuff like dilute sodium hypochlorite (aka 'liquid bleach'), alcohol-containing mouthwash (Listerine®), povidine iodine (Betadine®), or chlorhexidine (Hibiclens®). Most of this stuff isn't all that effective or worse, many of them will actually damage the bladder (especially mouthwash) by reacting chemically with the plastic elasticiser causing the bladder to become brittle. Nearly all BCD bladder materials already contain antimicrobial agents incorporated directly into the material, so no cleaners are required. Ordinary chlorinated, clean tap water works just fine to rinse out your BCD. Give It a Good Onceover — Before you store your BCD, take a quick look to see if there are any loose threads, seams or tears. Easier to take care of any issues before they became too big, or cause a problem underwater. Look for small tears and punctures, loose stitching and stressed fasteners. Repair with McNett Aquaseal to prevent further damage. Check for Leaks — Before your dive trip, fully inflate your BCD until the over pressure valve (OPV) releases, let it sit for 30 minutes and then check to see it is still fully inflated. If not, it's leaking. The cause of a leak may just be a dirty salt encrusted OPV that can be rinsed with fresh water. Check the Inflator — It's also good practice to occasionally hook up your power inflator hose to the BCD, pressurise the regulator, deflate the bladder and let the BCD sit for a while (the longer the better, for example, overnight). Then see if the BCD has 'self-inflated'. If it has, the power inflator is dribbling gas and should be replaced. Store your partially inflated BCD in a cool, clean, dry place, away from direct sunlight, fumes, solvents, and chemicals. The partial inflation will prevent the insides of the BCD from sticking together. To avoid stress on the air cell or harness assembly, remove all weight from the trim weight and releasable compartments before storing the BC. Soft weights especially, can discolour the BC over time. Store the BCD with the hose on the downward side, so that residual moisture drains to the hose assembly. Then after a day or two, depress the inflator button to allow any residual water to drain out. For prolonged storage, a small amount of silicone lubricant may be applied to the rubber parts of the BCD, but do not spray silicone inside the bag itself or on to the oral or power inflator mouthpiece assemblies. Do not store the BC in an enclosed space, such as a car trunk, where it may be exposed to temperatures below -18°C (0°F) or above 49°C (120°F). 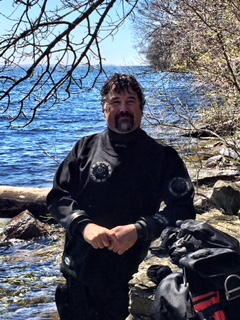 If you are going to store your BCD in your dive bag at least make sure it, and any other gear is bone dry. The last thing you need is mold to form on all that expensive equipment. When hanging your BCD up to dry, or for short or long-term storage, it's important to use a good, strong BCD hanger. Example we use the Underwater Kinetics Super BC and Regulator Hanger. Holds a BC Vest and regulator during drying and storage. It is built sturdy with high quality non-corrosive materials for safe drying. Provoking BCD problems instead of preventing them. Periodically we hear from divers who have damaged their wings by improper buoyancy control device (BCD) 'over-maintenance'. The most common damage takes the form of loss of the sealing gasket in the inflation assembly or over pressure valve (OPV). Another common damage is cross threading of the fittings on the inflation assembly or OPV. It's very easy to do because the threads are very fine and materials relatively soft. Both of these problems occur when the diver has made a routine practice of disassembling the inflation assembly and/or the OPV. Improper maintenance of your BCD can cause a loss of buoyancy control and create a life threatening situation. The Scuba Doctor recommends you do not disassemble your BCD as routine maintenance for this very reason. Good maintenance of your BCD is easy, no dis-assembly required. Most BCD manufacturers recommend regular and annual servicing consisting of cleaning, inspection and lubrication of specified parts. In fact, many manufacturers offer limited lifetime warranties that remain valid only if the BCD is serviced annually. CAUTION: DO NOT attempt to perform any disassembly or service of your BC. Service requiring disassembly must only be performed by a factory trained technician. To obtain any service or repair, it is important to bring your BC to an Authorized Dealer like O2ToGo Dive Centre. So there you have it, all the steps for care and maintenance of your buoyancy compensator. While it may seem like a lot while reading it, scuba BCD maintenance and care is easy and doesn't take much time. Stay on top of it and your buoyancy compensator device will last you a long time and save you money by not having to buy a new one. No matter how diligently you take care of your BCD, make sure to fully check and test it before use to ensure that it's in full working order. Above all, remember that by properly looking after your dive equipment, you are allowing it to continue looking after you.